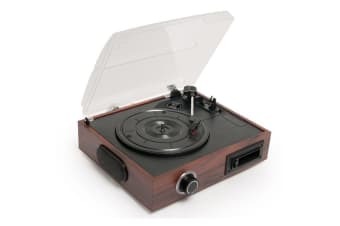 Read customer reviews of the mbeat USB Turntable and Cassette to Digital Recorder 2-in-1 (USB-TR08). After a purchase, we invite our customers to leave a product review. The customer reviews for mbeat USB Turntable and Cassette to Digital Recorder 2-in-1 (USB-TR08) are below. The product met my needs as I had expected. I can't comment because it is still in a box and purchased as a gift. It works excellently and looks good. Expected the turntable arm to return after the end of the LP and for the turntable to stop. The item is very user friendly and easy to operate. There is no loss of sound quality on the recording. Haven't opened the package yet! The software provided with this product did not allow me to record & save to my computer as stated. The software is so old & out-dated, that it did not allow me to save music to Windows Media Player as stated. I am very disappointed that I am unable to do what I bought this product to do,...that is record to pc & play music from Windows Media Player. I will have one more attempt to do this, if no good results, I will have to return the Turntable.